Tonight in Toronto, Swimming Canada hosted their Big Splash Awards, the annual ceremony that honors the best in Canadian Swimming (the equivalent of USA Swimming’s Golden Goggles Awards). The event was hosted at Toronto’s John Bassett Theater and featured a lineup of big-name Canadian celebrities from both inside and outside the sporting community. This included appearances by pop superstars Danny Fernandes, Shawn Desman, and Tyler Medeiros. But the real stars of the night, as well it should be, were the swimmers. The men’s Swimmer of the Year award went to Ryan Cochrane, who took silver medals at this summer’s World Championship meet in Shanghai in the 800 and 1500 meter freestyles. He won the honor ahead of Brent Hayden, who was the only other men’s individual swimming medalist. This marks Cochrane’s second-consecutive Big Splash honor for Male Swimmer of the Year. 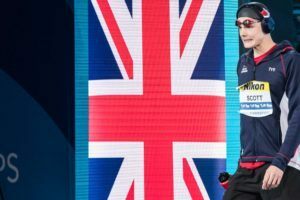 The women’s award went to Martha McCabe, who shocked the swimming community when she took a bronze in the 200 breaststroke at the World Championships, ahead of World Record holder and countrymate Annamay Pierse. The other nominees for the women’s award were Jillian Tyler and Sinead Russell. Hayden did receive a consolation prize in being honored with Swim of the Year for his silver-medal winning 100 freestyle performance for the World Championships. Richard Weinberger, who won the London 10km Marathon Swimming Invitational, which served as the Olympic test event. That victory was a runaway, as he was in fact the only nominee. His coach Ron Jacks was the Open Water Coach of the Year. Kevin Thornburn of the Etobicoke Swim Club won the Club Coach of the Year award, specifically designed for club teams. In terms of elite senior-level swimming, Josef Nagy of the Vancouver National Swim Center and Randy Bennett of the Island Swimming Association and the Victoria Amateur Swimming Club won the women’s and men’s Coach of the Year Awards. They coach McCabe and Cochrane, respectively. The men’s Para-Swimmer of the Year Award went to Benoit Huot, who is one of the most decorated Canadian Paralympians ever. He won four medals at the recent Para Pan Pac Swimming Championships. The women’s Para-Swimmer of the Year honor went to 18-year old Summer Mortimer, who has made a meteoric rise in the swimming community ahead of the 2012 Paralympic Games. The IMPACT award went to Alex Baumann, a former World Record holder, was honored for his role atop Canada’s Own the Podium program, a position from which he recently resigned after being diagnosed with prostate cancer earlier this year (his second battle with cancer). Baumann has played a huge role in the resurgence of Canadian swimming. The media award went to Scott Russell (no relation), a CBC broadcaster who works both hockey and Olympic telecasts.